Here I am with Brooke at her Bat Mitzvah. But after thinking about it for a long time, I decided that it was important for my loved ones to have as much of the story of my life as I can remember. When youre young, history doesnt matter; youre too busy with your own life to pay much attention to what your parents and grandparents have experienced. But when youre older, you care very much more about these things. I would give anything to have a book that tells me about my parents and grandparents lives. That isnt to say that writing this book has been easy. Its one of the hardest things Ive ever had to do. Sometimes I couldnt sleep because of the feelings and memories  both happy and sad  that it was stirring up. I found myself remembering people and places and events I hadnt thought of in years. Eve, Rick, myself, Talya and Tarah. My life has been rich in many ways. I have been married to two loving and devoted husbands. I have wonderful children and grandchildren, whom I love dearly. 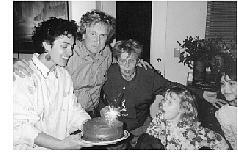 My stepchildren and their families have been, and continue to be, an extremely important part of my life. Im grateful to them. Ive heard it said that one should consider oneself lucky to make one or two real friends in a lifetime. I have been more than lucky in the friendships I have made. My many friends have given me much joy and helped sustain me in difficult times. Much of my life has not been easy. Ive suffered hunger. I have witnessed the deaths of my parents, two husbands and a sister. 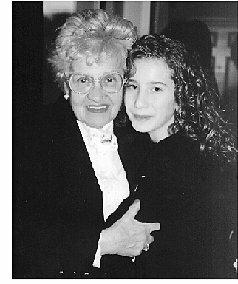 If someone had told the thirteen-year-old innocent I was in the summer of 1939 what I would experience over my next fifty-seven years, I would have said I didnt think a person could be strong enough to live through so much. Certainly, I wouldnt have thought that I could. Yet here I am. I know that others have experienced much worse. I can only imagine, for example, what it must have been like being my parents, not having enough bread to feed their children, let alone the far worse horrors so many others experienced during the Holocaust. This book was begun in October 1995 and finished in the days just after my seventieth birthday. It is based on my memories of things that I experienced. Ive tried hard to make sure that the facts are correct but I know that memory, mine own included, isnt perfect. Others may well have different memories of some of the events described in the pages above. All I can say is that I have tried to tell my story as honestly as I can. 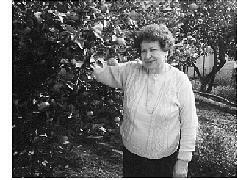 Pola by a fruit tree in Gitta's garden, 1995. Although I end this book with the death of Sam, whom I loved dearly, my life did not end with his death. For a long time I thought that it had. I thought it had ended when Leon died too. I mourned his passing for years. But somehow life goes on. At times it seems to come full circle. Take my last trip to Israel, for instance, in 1994.